This is the story of a dog’s journey from innocent puppy, to police dog in training, multiple handlers in the hospital, the threat of euthanasia, and his rehabilitation back to a functional working/sport dog with a long life and career ahead of him. Just three short years ago I was fortunate to have acquired from a reputable breeder in a California a bright eyed, driven little Malinois puppy destined for sport work. I had been carefully planning a new addition with the goal of becoming my next IPO candidate. After careful deliberation, I selected a hotly driven litter, and shortly after little “Hydro” came into my household at the ripe old age of seven weeks. Hydro, right from the get go, had fantastic talent. Driven for food, toy, and environmentally one of the most stable puppies I have ever had an opportunity to work. He had a full grip, an important component for an IPO dog, and boundless energy. While rather aloof with strangers, he was incredibly social to his little pack. Living in a subdivision at the time, Hydro was packed around and socialized at parks, Farmers Markets, taken on swimming excursions with his “sister” (a social little field trial bred Labrador puppy named “Pepper”, now a police canine), and in general had a normal puppyhood. I believe that puppy socialization and experiencing the world is important with any puppy in training; however with a very high drive, genetically reactive breed such a Malinois, exposure is even more important. Hydro experienced PetSmart, Home Depot, Lowes, mini road trips, and received exposure to dogs frequently coming and going for training. I believe immersing this puppy in a safe manner desensitized him during his early years, without forcing any social (human) interaction. We did clicker training in all environments, with easy behaviors: watch, spin, touch, back-back, sit, down, stand, and place. We would engage is tug play pre-teething, and of course during teething all tug play ceased. At six months old, after teething, proper play began again and he was still a bundle of naughty energy, running off energy with my Border Collie (Seamus). At as early as twelve weeks one could see Hydro’s propensity for anti-social behavior, and knowing the breed and bloodlines, I developed alternate behaviors in lieu of forced interaction. In fact, the breeder had mentioned his very slight reactive behavior while taking him to the vet for his health certificate at seven weeks, so this was not a surprise and NOT AN ISSUE. 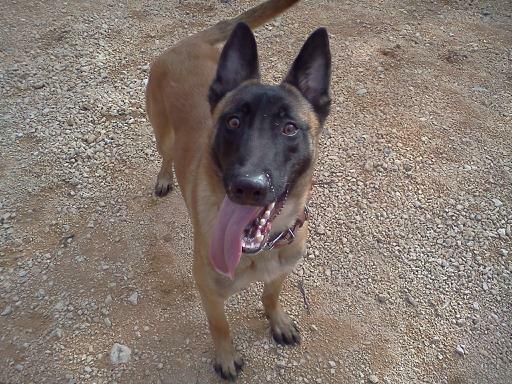 Malinois are reactive dogs, and active biters. Modern Malinois are becoming a bit more user friendly, and while they may not possess some of the fighting instincts and aggression attributes many old school Europeans admire, they are none the less good dogs that fit into modern society. 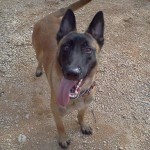 Hydro is an old style Malinois, The type of dog that a stranger will not get out of a crate, and demands fair and just treatment. He was never asked or placed in a situation where he had to make decisions on his own from the time he was a baby to the time that he went to his first police training home at the age of two years. He was, and still is, a dog that only likes to be touched by his “person”. After all, if you want a social butterfly a Golden Retriever is a more logical choice, but for a working dog Hydro was everything a good, old fashioned Malinois should be. As an avid obedience lover, Hydro learned many incremental behaviors to manage his energy, drive, and frustration. Dog training is not only a science, it is an art. Feeling what the dog requires is important, and in Hydro’s case he did not require any drive building. It was genetically ingrained. He did require desensitizing and counter conditioning. That was challenging, but by managing 1) environment, 2) thresholds/ arousal levels, 3) physical exertion, we made fabulous progress. By all accounts, THIS WAS A FABULOUS WORKING PROSPECT. As he developed, Hydro’s energy level required more than just training sessions, walks, and hikes. I purchased a treadmill, and he would simply walk on the treadmill for approximately 45 minutes a day. This low arousal, low drive expenditure of energy kept him focused and in balance. Around a year of age (9 months through 14 months) Hydro became what I would like to call “cheeky”. He was a bundle of energy, starting to assert himself, and often didn’t have control of his emotions. This was the most difficult time working with Hydro. In fact, my training partner and boyfriend Chris Vaughn, graciously helped with Hydro on more than one occasion from nail trimming to walking. What I would like to stress most was that handling Hydro, even during restraint or clear correction, had to be done in a NON THREATENING, NON EMOTIONAL, and IMPERSONAL MANNER. This is key, because I believe after Hydro left our care and training this was the defining factor is his behavior change (not to mention the importance of developing a relationship and bond). He was started in tracking (I hate tracking, but he loved it), obedience above all else, and controlled and low stimulation bite work. We never, ever tapped into aggression. Never worked him over threshold, and always showed him a clear path to success (getting what Hydro wanted through compliance). He was a rock star. Plain and simple. As Hydro matured I could see his fighting drive and desire for independent work made him a more suitable police canine candidate than sport candidate. Also, around the same time his grip (while full) required a little more maintenance to keep calm. He is a fighty fellow, and love to fight, and I felt it was unfair to force a square peg in a round hole. So, the difficult decision was made to allow Hydro to go on to a career as a police dog. Having working with a local vendor in Tennessee on previous occasions, Hydro went into specialized police canine training. He advanced his education to include specific tasks, and learned about detection work (drug detection). We received glowing reports back in the short span from two years of age (when we went on to his new career) to almost 2.5 years. We received word that Hydro was purchased by a department in GA, and that he had a bright future ahead of him as a dual purpose prospect. We were excited for him to make the next step in his career as a full time police canine! **Stay tuned for the next chapter of Hydro’s career, and the turning point in his behavior, possible triggers, and current rehab process.